Timber looks good and adds to the visual aesthetic in any design application. But there’s one more reason for choosing timber for your next project – the many environmental benefits. When choosing timber cladding panels over other cladding panel materials, take into consideration the environmental advantages of timber. 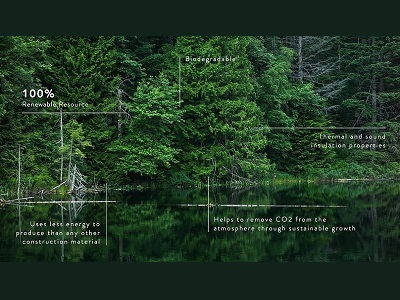 Timber is a 100% renewable resource and biodegradable; helps remove CO2 from the atmosphere through sustainable growth; uses less energy to produce than any other construction material; and generates much lower CO2 emissions in production than alternative materials. Timber’s outstanding thermal and sound insulation properties provide ongoing benefits to the client. Therefore, it’s no wonder many forward thinking architects around the world are beginning to use timber cladding panels on innovative and often elaborate architectural, industrial and residential projects.